Navigate to the Section Manager. To add a new Section, press the "New" icon in the toolbar. To edit an existing Section, click on the Section's Title, or click the Section's checkbox, and click on the "Edit" icon in the toolbar. There is where you can add a new Section or edit an existing Section. Sections in Joomla! are used to organize Articles. Sections are the top-level of organization, and each Section contains one or more Categories. 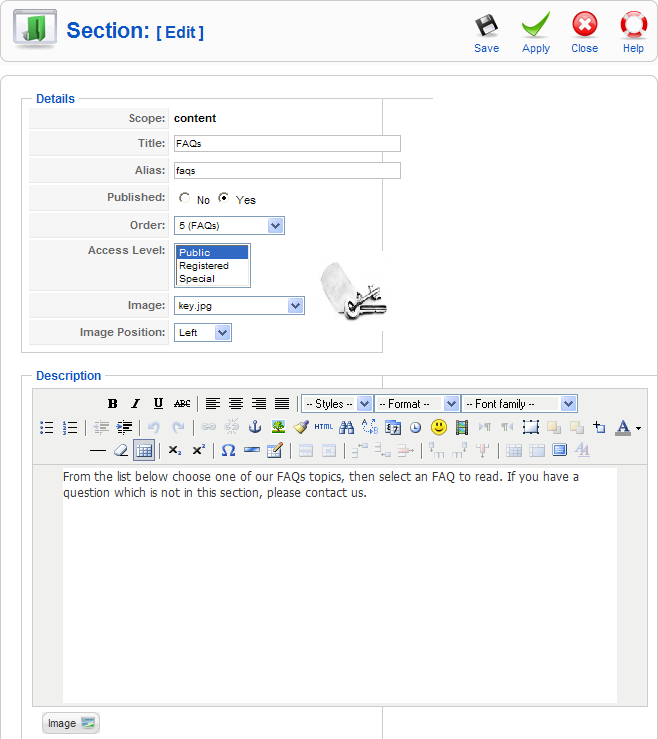 Sections and Categories allow you to organize your Articles and display related Articles together on a page. All Articles are assigned either to a Section you create or to the special Section called 'Uncategorized'. Scope. No entry allowed. Displays the scope of this screen, which is "Content". Order. The order this item will display in the Manager screen. Use the drop-down list box to change the Order. You can select 'First' or 'Last' to make this the first or last item. Or you can select an item from the list. In this case, the current item will be listed just after the item you select. Note that the Order can also be changed in the Manager screen. This page was last modified on 4 August 2012, at 22:22.